The picnic set is ideal for a fun family day at the park, to use while camping and is even great for backyard barbecues! 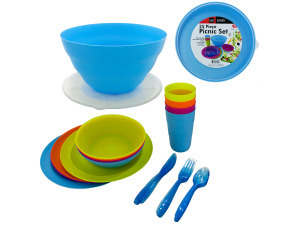 Set includes: 4 plastic plates, 4 plastic bowls, 4 plastic tumblers and and a set of 4 knives, forks and spoons. The entire set is packaged inside a storage bowl with lid which is perfect for salads!